Let's discuss about the types of valves and clamps which are used to avoid any type of contamination in the food industry. If you are a brewer,then knowledge about sanitization is an absolute necessity. Quality sanitary fittings are really necessary for the food processing industry to maintain the freshness and authenticity of food and beverages. Sanitized tri clamp valves are largely used in various industries including food processing, juice, dairy, soft drinks, wine, and breweries. The tri clover ball fittings and valves work as a connector between the pipes and the tubes that transport of the liquid. 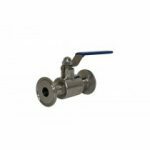 The tri-clamp valves are sanitary valves and can be easily disassembled for washing and cleaning purposes. Usually,breweries do not usually this type of fitting but breweries and food & beverage processing units, need them. Just like a tri clamp valve, there are three parts; two Ferrules, one clamp and one gasket. The clamp holds the fittings together in order to seal them and compress the gasket. The clamps are easy to connect.In simple terms the clamps offer easy disassembling of the fitting to clean, inspect and change as required. Stainless steel ball valves are affordable and cost-effective but are more difficult to clean. Despite being one of the most versatile and durable valves, they are used less due to the risk of sediment collecting in the threads. Due to possible the crevices in the ball, it is difficult to clean them thoroughly. Since contamination of food is really dangerous to health, breweries, food & beverage factories and like dairy farms, avoid using 2 piece ball valves. They are not good for sanitary purposes. Tri clamp butterfly valves or tri clamp valves have flanged ends.The valve clamps come in half and full locking so that you can easily see know the exact connection position of the pipes. These valves are standard in the brewery, dairy and food and beverage industries and there are no issues with contamination. These clamps can be easily disassembled so that they can be cleaned accordingly. They are widely used in almost all industries like Wineries, Dairies, Breweries and Home brewer’s industry. They are sturdy and work great for sanitary purposes where a quick connection is required. The butterfly valve also comes with a tri-clamp ball valve that is considered the best among all the valves. It is a three piece valve that is easy to disassemble and then assemble. However, you need a pair of wrenches and some associated tools to dismantle the valve from the pipe and tube connection. Whatever the type of industry, it is important to know the difference between the various valves and tri-clamps and their uses. Since sanitization is of paramount importance in the food industry, it is imperative to use a valve that is easy to clean and will avoid any contamination.